The notion of culture in animals dates back to Aristotle and Darwin, but the association of animals' actions with the actual word "culture" first was brought forward with Japanese primatologists' discoveries of socially transmitted food behaviors in the 1940s. One definition of culture, particularly in relation to the organizational aspect is the utilization of "involvement, consistency, adaptation, and mission." Cultural traits that are indicators of a successful form of organization are more likely to be assimilated into our everyday lives. Organizations that utilize the four aforementioned aspects of culture are the ones that are the most successful. Therefore, cultures that are better able to involve their citizens towards a common goal have a much higher rate of effectiveness than those who do not have a shared goal. A further definition of culture is, "[s]ocially transmitted behavior patterns that serve to relate human communities to their ecological settings." This definition connects cultural behavior to the environment. Since culture is a form of adaptation to ones environment, it is mirrored in many aspects of our current and past societies. Other researchers are currently exploring the idea that there is a connection between cultural sociology and psychology. Certain individuals are especially concerned with the analysis of studies connecting "identity, collective memory, social classification, logics of action, and framing." Views of what exactly culture is has been changing due to the recent convergence of sociological and psychological thought on the subject. "Recent work depicts culture as fragmented across groups and inconsistent across its manifestations. The view of culture as values that diffuse other aspects of belief, intention, and collective life has succumbed to one of culture as complex rule-like structures that constitute resources that can be put to strategic use." Culture is specific to region and not just one umbrella definition or concept can truly give us the essence of what culture is. Also referenced is the importance of symbols and rituals as cognitive building blocks for a psychological concept shared culture. Richard Dawkins argues for the existence of a "unit of cultural transmission" called a meme. This concept of memes has become much more accepted as more extensive research has been done into cultural behaviors. Much as one can inherit genes from each parent, it is suggested that individuals acquire memes through imitating what they observe around them. The more relevant actions (actions that increase ones probability of survival), such as architecture and craftwork are more likely to become prevalent, enabling a culture to form. The idea of memes as following a form of Natural Selection was first presented by Daniel Dennett. It has also been argued by Dennett that memes are responsible for the entirety of human consciousness. He claims that everything that constitutes humanity, such as language and music is a result of memes and the unflinching hold they have on our thought processes. There was a hypothetical simulation conducted in which a population selects different memes. It shows both the positive and negative side effects of these hypothetical imitations. One of the main disparities between humans and animals is that humans have a much higher capacity for imitation. Also concluded was that the use of memes is responsible for the large brain size of humans. By mapping how long each of these memes will take to become an actual cultural change the conclusion of the study was that it is possible for human culture to have evolved using this model. A closely related concept to memes is the idea of evolutionary culture. The validity of the concept of evolutionary culture has been increasing recently due to the re-evaluation of the term by anthropologists. The broadening scope of evolution from simple genes to more abstract concepts, such as designs and behaviors makes the idea of evolutionary culture more plausible. Evolutionary culture theory is defined as "a theory of cultural phylogeny." The idea that all human culture evolved from one main culture has been presented, citing the interconnectedness of languages as one of his examples has also been presented. There is, however, also the possibility for disparate ancestral cultures, in that the cultures we see today may potentially have stemmed from more than one original culture. According to the Webster's dictionary definition of culture, learning and transmission are the two main components of culture, specifically referencing tool making and the ability to acquire behaviors that will enhance one's quality of life. Using this definition it is possible to conclude that animals are just as likely to adapt to cultural behaviors as humans. One of the first signs of culture in early humans was the utilization of tools. Chimpanzees have been observed using tools such as rocks and sticks to obtain better access to food. There are other learned activities that have been exhibited by animals as well. Some examples of these activities that have been shown by varied animals are opening oysters, swimming, washing of food, and unsealing tin lids. This acquisition and sharing of behaviors correlates directly to the existence of memes. It especially reinforces the natural selection component, seeing as these actions employed by animals are all mechanisms for making their lives easier, and therefore longer. Though the idea of 'culture' in animals has only been around for just over half of a century, scientists have been noting social behaviors of animals for centuries. Aristotle was the first to provide evidence of social learning in the songs of birds. Charles Darwin first attempted to find the existence of imitation in animals when attempting to prove his theory that the human mind had evolved from that of lower beings. Darwin was also the first to suggest what became known as social learning in attempting to explain the transmission of an adaptive pattern of behavior through a population of honey bees. The vast majority of cultural anthropological research has been done on non-human primates, due to their being closest evolutionarily to humans. In non-primate animals, research tends to be limited, and therefore evidence for culture strongly lacking. However, the subject has become more popular recently, and has prompted the initiation of more research into the area. Culture, when defined as the transmission of behaviors from one generation to the next, can be transmitted among animals through various methods. The most common of these methods include imitation, teaching, and language. Imitation has been found to be one of the most prevalent modes of cultural transmission in non-human animals, while teaching and language are much less widespread, with the possible exceptions of primates and cetaceans. Recent research has suggested that teaching, as opposed to imitation, may be a characteristic of certain animals who have more advanced cultural capacities, though this is debatable. Culture, which was once thought of as a uniquely human trait, is now firmly established as a common trait among animals and is not merely a set of related behaviors passed on by genetic transmission as some have argued. Genetic transmission, like cultural transmission, is a means of passing behavioral traits from one individual to another. The main difference is that genetic transmission is the transfer of behavioral traits from one individual to another through genes which are transferred to an organism from its parents during the fertilization of the egg. As can be seen, genetic transmission can only occur once during the lifetime of an organism. Thus, genetic transmission is quite slow compared to the relative speed of cultural transmission. In cultural transmission, behavioral information is passed through means of verbal, visual, or written methods of teaching. Therefore, in cultural transmission, new behaviors can be learned by many organisms in a matter of days and hours rather than the many years of reproduction it would take for a behavior to spread among organisms in genetic transmission. Until recently, teaching was a skill that was thought to be uniquely human. Now, as research has increased into the transmission of culture in animals, the role of teaching among animal groups has become apparent. Teaching is not merely limited to mammals either. Many insects, for example have been observed demonstrating various forms of teaching in order to obtain food. Ants, for example, will guide each other to food sources through a process called "tandem running," in which an ant will guide a companion ant to a source of food. It has been suggested that the "pupil" ant is able to learn this route in order to obtain food in the future or teach the route to other ants. There have been various recent studies that show that cetaceans are able to transmit culture through teaching as well. Killer whales are known to "intentionally beach" themselves in order to catch and eat pinnipeds who are breeding on the shore. Mother killer whales teach their young to catch pinnipeds by pushing them onto the shore and encouraging them to attack and eat the prey. Because the mother killer whale is altering her behavior in order to help her offspring learn to catch prey, this is evidence of teaching and cultural learning. The intentional beaching of the killer whales, along with other cetacean behaviors such as the variations of songs among humpback whales and the sponging technique used by the bottlenose dolphin to obtain food, provide substantial support for the idea of cetacean cultural transmission. Imitation can be found in a few members of the avian world, in particular the parrot. Imitation forms the basis of culture, but does not on its own imply culture. Imitation is often misinterpreted as merely the observation and copying of another's actions. This would be known as mimicry, because the repetition of the observed action is done for no other purpose than to copy the original doer or speaker. In the scientific community, imitation is rather the process in which an organism purposefully observes and copies the methods of another in order to achieve a tangible goal. Therefore, the identification and classification of animal behavior as being imitation has been very difficult. Recent research into imitation in animals has resulted in the tentative labeling of certain species of birds, monkeys, apes, and cetaceans as having the capacity for imitation. For example, a Grey parrot by the name of Alex underwent a series of tests and experiments at the University of Arizona in which scientist Irene Pepperberg judged his ability to imitate the human language in order to create vocalizations and object labels. Through the efforts of Pepperberg, Alex has been able to learn a large vocabulary of English words and phrases. Alex can then combine these words and phrases to make completely new words which are meaningless, but utilize the phonetic rules of the English language. Alex's capabilities of using and understanding more than 80 words, along with his ability to put together short phrases, demonstrates how birds, who many people do not credit with having deep intellect, can actually imitate and use rudimentary language skills in an effective manner. The results of this experiment culminated with the conclusion that the use of the English language to refer to objects is not unique to humans and is arguably true imitation, a basic form of cultural learning found in young children. Language is another key indicator of animals who have greater potential to possess culture. 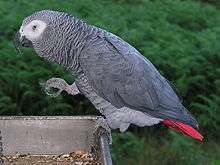 Though animals do not naturally use words like humans when they are communicating, the well-known parrot Alex demonstrated that even animals with small brains, but are adept at imitation can have a deeper understanding of language after lengthy training. A bonobo named Kanzi has taken the use of the English language even further. Kanzi was taught to recognize words and their associations by using a lexigram board. Through observation of its mother's language training, Kanzi was able to learn how to use the lexigrams to obtain food and other items that he desired. Also, Kanzi is able to use his understanding of lexigrams to decipher and comprehend simple sentences. For example, when he was told to "give the doggie a shot," Kanzi grabbed a toy dog and a syringe and gave it a realistic injection. This type of advanced behavior and comprehension is what scientists have used as evidence for language-based culture in animals. 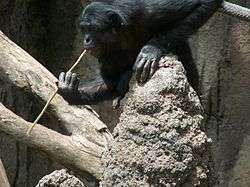 A bonobo fishing for termites using a sharpened stick. Tool usage in acquiring food is believed to be a cultural behavior. The beginning of the modern era of animal culture research in the middle of the 20th century came with the gradual acceptance of the term "culture" in referring to animals. Japan's leading primatologist of the time, Kinji Imanishi, first used the word with a prefix as the term "pre-culture" in referring to the now infamous potato-washing behavior of Japanese macaques. In 1948, Imanishi and his colleagues began studying macaques across Japan, and began to notice differences among the different groups of primates, both in social patterns and feeding behavior. In one area, paternal care was the social norm, while this behavior was absent elsewhere. One of the groups commonly dug up and ate the tubers and bulbs of several plants, while monkeys from other groups would not even put these in their mouths. Imanishi had reasoned that, "if one defines culture as learned by offspring from parents, then differences in the way of life of members of the same species belonging to different social groups could be attributed to culture." Following this logic, the differences Imanishi and his colleagues observed among the different groups of macaques may suggest that they had arisen as a part of the groups' unique cultures. The most famous of these eating behaviors was observed on the island of Koshima, where one young female was observed carrying soiled sweet potatoes to a small stream, where she proceeded to wash off all of the sand and dirt before eating. This behavior was then observed in one of the monkey's playmates, then her mother and a few other playmates. The potato-washing eventually spread throughout the whole macaque colony, encouraging Imanishi to refer to the behavior as "pre-culture," explaining that, "we must not overestimate the situation and say that 'monkeys have culture' and then confuse it with human culture." 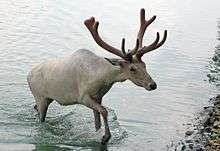 At this point, most of the observed behaviors in animals, like those observed by Imanishi, were related to survival in some way. 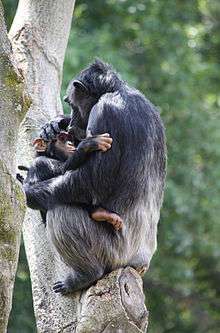 A chimpanzee mother and baby. The first evidence of apparently arbitrary traditions came in the late-1970s, also in the behavior of primates. At this time, researchers McGrew and Tutin found a social grooming handclasp behavior to be prevalent in a certain troop of chimpanzees in Tanzania, but not found in other groups nearby. This grooming behavior involved one chimpanzee taking hold of the hand of another and lifting it into the air, allowing the two to groom each other's armpits. Though this would seem to make grooming of the armpits easier, the behavior actually has no apparent advantage. As Frans de Waal explains from his later observations of the hand-clasp grooming behavior in a different group of chimpanzees, "A unique property of the handclasp grooming posture is that it is not required for grooming the armpit of another individual... Thus it appears to yield no obvious benefits or rewards to the groomers." Prior to these findings, opponents to the idea of animal culture had argued that the behaviors being called cultural were simply behaviors that had evolutionarily evolved due to their importance to survival. After the identification of this initial non-evolutionarily advantageous evidence of culture, scientists began to find differences in group behaviors or traditions in various groups of primates, specifically in Africa. More than 40 different populations of wild chimpanzees have been studied across Africa, between which many species-specific, as well as population-specific, behaviors have been observed. The researching scientists found 65 different categories of behaviors among these various groups of chimpanzees, including the use of leaves, sticks, branches, and stones for communication, play, food gathering or eating, and comfort. Each of the groups used the tools slightly differently, and this usage was passed from chimpanzee to chimpanzee within the group through a complex mix of imitation and social learning. Second only to non-human primates, culture in species within the order Cetacea, which includes whales, dolphins, and porpoises, has been studied for numerous years. In these animals, much of the evidence for culture comes from vocalizations and feeding behaviors. Cetacean vocalizations have been studied for many years, specifically those of the bottlenose dolphin, humpback whale, killer whale, and sperm whale. Since the early 1970s, scientists have studied these four species in depth, finding potential cultural attributes within group dialects, foraging, and migratory traditions. Hal Whitehead, a leading cetologist, and his colleagues conducted a study in 1992 of sperm whale groups in the South Pacific, finding that groups tended to be clustered based on their vocal dialects. The differences in the whales' songs among and between the various groups could not be explained genetically or ecologically, and thus was attributed to social learning. In mammals such as these sperm whales or bottlenose dolphins, the decision on whether an animal has the capacity for culture comes from more than simple behavioral observations. As described by ecologist Brooke Sergeant, "on the basis of life-history characteristics, social patterns, and ecological environments, bottlenose dolphins have been considered likely candidates for socially learned and cultural behaviors," due to being large-brained and capable of vocal and motor imitation. In dolphins, scientists have focused mostly on foraging and vocal behaviors, though many worry about the fact that social functions for the behaviors have not yet been found. As with primates, many humans are reluctantly willing, yet ever so slightly willing, to accept the notion of cetacean culture, when well evidenced, due to their similarity to humans in having "long lifetimes, advanced cognitive abilities, and prolonged parental care." The songs of starlings have been discovered to show regional "dialects," a trait that has potential to have a cultural basis. 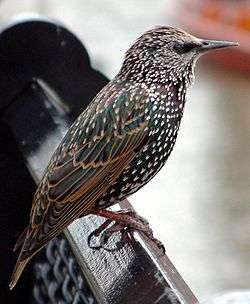 Birds have been a strong study subject on the topic of culture due to their observed vocal "dialects" similar to those studied in the cetaceans. These dialects were first discovered by zoologist Peter Marler, who noted the geographic variation in the songs of various songbirds. Many scientists have found that, in attempting to study these animals, they approach a stumbling block in that it is difficult to understand these animals' societies due to their being so different from our own. This makes it difficult to understand the animals' behaviors, let alone determine whether they are cultural or simply practical. However, despite this hindrance, evidence for differing dialects among songbird populations has been discovered, especially in sparrows, starlings, and cowbirds. In these birds, scientists have found strong evidence for imitation-based learning, one of the main types of social learning. Though the songbirds obviously learn their songs through imitating other birds, many scientists remain skeptical about the correlation between this and culture: "...the ability to imitate sound may be as reflexive and cognitively uncomplicated as the ability to breathe. It is how imitation affects and is affected by context, by ongoing social behavior, that must be studied before assuming its explanatory power." The scientists have found that simple imitation does not itself lay the ground for culture, whether in humans or birds, but rather it is how this imitation affects the social life of an individual that matters. Guppy mating behavior is believed to be culturally influenced. When moving past birds and into other creatures, the cultural research becomes few and far between. Notable research has been done with black rats, Norwegian rats, guppies, and ants. Among the cultural studies of rats, the most widely discussed research is that performed by Joseph Terkel in 1991 on a species of black rats that he had originally observed in the wild in Israel. Terkel conducted an in-depth study aimed to determine whether the observed behavior, the systematic stripping of pine cone scales from pine cones prior to eating, was a socially acquired behavior, as this action had not been observed elsewhere. The experimentation with and observation of these black rats was one of the first to integrate field observations with laboratory experiments to analyze the social learning involved. From the combination of these two types of research, Terkel was able to analyze the mechanisms involved in this social learning to determine that this eating behavior resulted from a combination of ecology and cultural transmission, as the rats could not figure out how to eat the pinecones without being "shown" by mature rats. Though this research is fairly recent, it is often used as a prime example of evidence for culture in non-primate, non-cetacean beings. ↑ De Waal, Frans. The Ape and the Sushi Master: Cultural Reflections by a Primatologist. New York: Basic Books, 2001. 1 2 3 4 5 6 Laland, Kevin N. and Bennett G. Galef, eds. The Question of Animal Culture. Cambridge, Mass: Harvard UP, 2009. 1 2 3 4 Holdcroft, David, and Harry Lewis. Memes, Minds, and Evolution. Philosophy 75.292 (2000): 161-182. ↑ Heyes, Cecelia M. and Bennett G. Galef, Jr., eds. Social Learning in Animals: The Roots of Culture. San Diego: Academic Press, 1996. ↑ Matsuzawa, Tetsurō, Masaki Tomonaga, and M. Tanaka. Cognitive Development in Chimpanzees. Tokyo: Springer, 2006. 1 2 Hoppitt WJ, GR Brown, R Kendal, L Rendell, A Thornton, MM Webster, and KN Laland. Lessons from Animal Teaching. Trends in Ecology & Evolution (Personal Edition). 23. 9 (2008): 486-93. 1 2 3 4 5 6 7 Rendell L, and H Whitehead. Culture in Whales and Dolphins. The Behavioral and Brain Sciences. 24. 2 (2001): 309-24. ↑ Hurley, S. L., and Nick Chater. Perspectives on Imitation From Neuroscience to Social Science. CogNet. Cambridge, Mass: MIT Press, 2005. ↑ Pepperberg, Irene M. Grey Parrots Do Not Always 'parrot': the Roles of Imitation and Phonological Awareness in the Creation of New Labels from Existing Vocalizations. 1 2 3 4 Hillix, William A., and Duane M. Rumbaugh. Animal Bodies, Human Minds: Ape, Dolphin, and Parrot Language Skills. Developments in primatology. New York: Kluwer Academic/Plenum Publishers, 2004. 1 2 Huffman, Michael A., Charmalie A.D. Nahallage, and Jean-Baptiste Leca. Cultured Monkeys: Social Learning Cast in Stones. Current Directions in Psychological Science 17 (2008) 410-414. 1 2 Whiten, A., J. Goodall, W.C. McGrew, T. Nishida, V. Reynolds, Y. Sugiyama, C.E.G. Tutin, R.W. Wrangham, and C. Boesch. Cultures in Chimpanzees. Nature 399 (1999): 682-685. ↑ Sargeant, Brooke L., and Janet Mann. From Social Learning to Culture: Intrapopulation Variation in Bottlenose Dolphins. The Question of Animal Culture. Ed. Kevin N. Laland and Bennett G. Galef. Cambridge, Mass: Harvard UP, 2009. 152-73. 1 2 West, Meredith J., and Andrew P. King. Social Learning: Synergy and Songbirds. Social Learning in Animals: The Roots of Culture. Ed. Cecelia M. Heyes and Bennett G. Galef. San Diego: Academic P, 1996. 155-78. ↑ Terkel, Joseph. Cultural Transmission of Feeding Behavior in the Black Rat (Rattus rattus). Social Learning in Animals: The Roots of Culture. Ed. Cecelia M. Heyes and Bennett G. Galef. San Diego: Academic P, 1996. 17-48. ↑ Galef, Bennett G. Culture in Animals? The Question of Animal Culture. Ed. Kevin N. Laland and Bennett G. Galef. Cambridge, Mass: Harvard UP, 2009. 222-246.